By definition, interlock is “to connect so that motion of any part is constrained by another”. 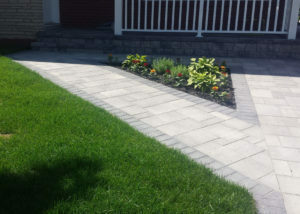 As suggested by its name, interlock pavers are a type of paving material, commonly made of cement or concrete, that is connected together by a mixture of pavers, bedding sand, edge restraint and joint sand. When installed properly, this combination becomes a unified whole, making it strong and durable. Interlocking paver blocks also have the ability to transfer loads and stresses laterally by means of an arching of bridging between units, spreading the load over a large area, reduces the stress thereby allowing heavier loads and traffic over sub-bases which normally would require heavily reinforced concrete. Interlocking pavers have the advantage of being an easy self-installation paving material for homeowners or contractors. With its special interlocking feature, it enables pavers to be easily installed without the use of mortar. This versatile paving material is modular, meaning that they connect together to form a variety of geometric designs. And with the vast color and design selections, it has become a popular choice for homeowners today. 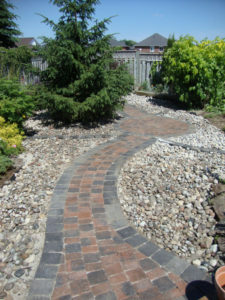 Interlocking pavers is an alternative to virtually any application that you would normally use bricks or concrete for. From driveways to patios, walkways to pool decks, interlock pavers are aesthetically pleasing, simulating the effects of cobblestone pathways and increasing the property value with its elegant curb appeal. 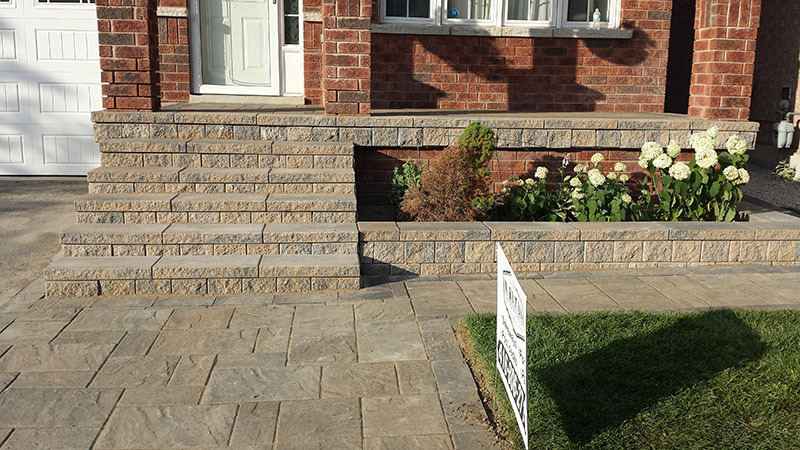 Interlock pavers are all in their essence durable and can last upwards of 40+ years. With proper maintenance and timely repairs, pavers can keep looking great for years to come. Almost all the major manufacturers offer comparable quality products with similar designs and sizes, differing mostly only by name. There are varying thickness for interlock pavers and depending on the location these products will be installed, the correct thickness must be adhered to ensure the prolonged durability of the paved surface. For instance, 60mm pavers is substantial enough for areas used for standard foot traffic. However, we recommend using 80mm pavers on parking areas as they offer a more durable solution and will refrain from shifting and cracking under the weight of a vehicle. Location: where these pavers will be installed (backyard, pool deck, parking surface etc.) all contribute to the decision making as different pavers are more suitable for certain areas. Design: What look do you wish to attain. Simple? Modern? Traditional? Or random look? There are pavers that can achieve any style you fancy. Color: Once you have selected the paver that you feel is right for you, you will need to decide on a color. There are many different colors available that all vary from one product to the next. This task may either be very simple (if you already know what palette you want for your landscape) or nerve wrecking when presented with the abundant of color choices. Interlock pavers are typically covered by the manufacturer for a 25 year period. Their warranty refers to the physical products structural capacity. Things different manufacturers might warranty are; discoloration, deteriorating products, inconsistent molds, ext. If you are shipped an inferior product that does not meet the companies quality standard, they will usually replace the products at their own cost. If you notice issues with the products after your contractor has installed them, you will need to contact a rep from the manufacturer to come out and take a look at the products in person. If they accept that it is a manufacturing or product defect, than they will ship you replacement products to have installed by a contractor of your choosing at YOUR cost. At Markstone Landscaping, we warranty our WORKMANSHIP for two years. This covers any issues with sinking, shifting, settling, or heaving. You will typically notice these issues occur after the first winter. Usually winters have the most affect on interlock pavers due to the ground constantly freezing and thawing. We like to provide a two year warranty to enable two complete winters to see if any issues arise. If problems arise after the two years, it becomes less of a workmanship issue and more of a maintenance. If Interlock pavers are not maintained regularly (every 2 to 3 years), you will notice gaps between the pavers will increase in size, which allows the pavers to shift and debris to accumulate in the spacing. Please refer to our article Interlock maintenance to see how to maintain your interlock pavers.